Two weeks ago, we covered Chomp‘s news that it will be powering app search on Verizon’s app store for all Android phones. Today, the app search early player is announcing some more big news, and this time advertisers and developers are the ones who stand to benefit. Launching in private beta today is “Chomp Search Ads”, a new program that will allow developers to bid on the keywords or phrases that will deliver their ads to users who search for those terms within an app search engine. The ad engine then matches app ads to the most relevant potential customer based on what apps they’re currently searching, making ads less annoying and more relevant for the consumer and ideally more lucrative for developers. During the early stage of its private beta, Chomp will be opening up its search ad engine to a select group of advertisers, with Milk and Zaarly being two of the first companies to participate. “Being able to advertise the Oink app to people that are in the process of looking for something just like it is a form of targeting we haven’t seen before”, says Milk (and Digg) founder Kevin Rose. For advertisers and developers, this additional targeting is absolutely huge. Just consider the market. As Erick reported back in January, according to Gartner, $893 million was spent on app advertising in 2010, with total app revenue predicted to skyrocket to $50 billion by 2014 — up to $20 billion of which is likely to be spent on advertising in apps. 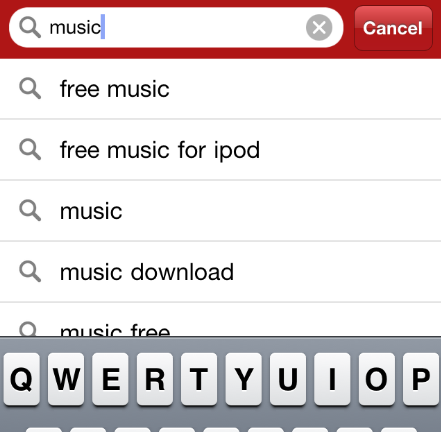 And what’s even more relevant to app search engines like Chomp? Over 200 million iOS and Android users search for apps every month. Needless to say, if the ad engine’s implementation goes smoothly and matching is up to par, this could be a huge move for Chomp, potentially encouraging developers (who spend 20 to 30 percent of app revenues on marketing etc.) to come flocking. As to how it will work? Like Google’s AdWords, Chomp Search Ads will be an auction-based service, in which developers set up an account and pre-fill the account with ad dollars. At which point Chomp will “recommend search terms and developers can bid for those keywords, setting a daily maximum spend as well as a maximum bid price for a given keyword or phrase”, according the Chomp’s release. Chomp will then show ads based on bid price and relevancy, with developers’ accounts being charged only when users click on the ad through a “Get It” button. And, just like Google does for web advertising, the startup will provide users with campaign reporting and analytics to measure the effectiveness of their ad dollars. The value proposition here is potentially very high, as traditional app advertising has not been up to speed with web advertising, rarely accounting for the delivered ad’s relevance to the consumer. Much of app display advertising fails to deliver meaningful results, and many developers have shied away from integrating advertising into their apps for this very reason. It just wasn’t worth the money. But if Chomp can live up to its promise, this could be a big win for developers, consumers, and, well, Chomp. 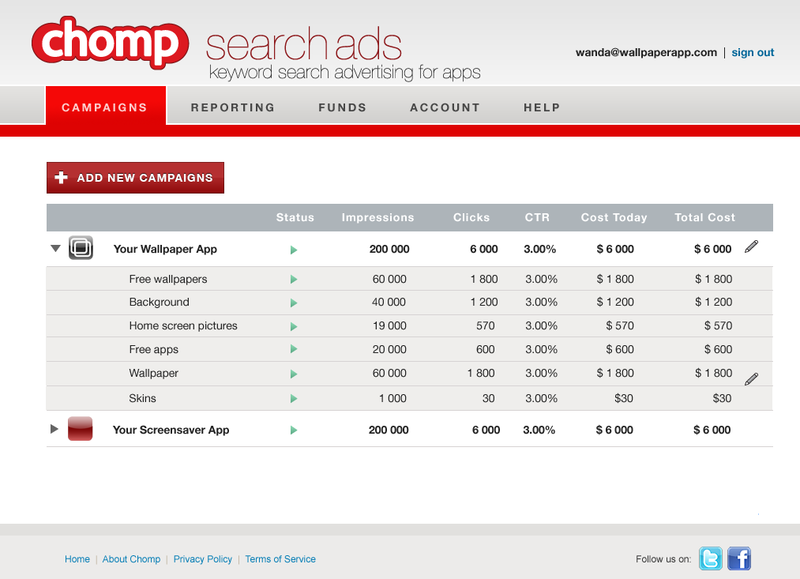 The startup’s search ads are available in private beta at ads.chomp.com here. What’s more, the app search engine is complementing the announcement of its search ad functionality with the launch of a redesigned app for the iPhone, complete with a new interface and bringing the features that will go live with Verizon’s app store like the ability to discover new apps based on keywords, types, and categories — not just by name search. Chomp for iPhone’s new design features a prominent search box that integrates Google’s now-taken-for-granted implementation of realtime search. Meaning that, from the moment the user types a letter into the search bar on their phone, Chomp’s new search begins automatically displaying results. The results will also now display large “app cards” that include the app’s name, price, review rating and a “Get It” button, according to Chomp Co-founder Ben Keighran, providing a natural way for users to get a basic sense of the app and its relevance to their search. Chomp’s home screen will also include top ten suggested search terms based on what’s trending (while displaying preview icons of those apps), as well as five user-recommended topic titles that can be searched based on category and a “Related Searches” feature. Look out app search engines, Chomp’s addition of search advertising and enhancement of its search functionality across its platforms are moving it ever closer to becoming the Google of app search engines, and ever farther away from being the AltaVista. For more, check out Chomp on iTunes here.